"You Don't Recruit John Steele. You Unleash Him." Lt. John Steele (Kove) is a man who plays by his own rules. He survived the horrors of the Vietnam war, including being trapped in a cave with "ratbombs", or bombs strapped to rats. Now, in the "present day", both he and his 'Nam buddy Lee (Robert Kim) are L.A. cops. Helping them in their quest to take down the evil drug-dealing gang the Black Tigers is Reese (Casey). 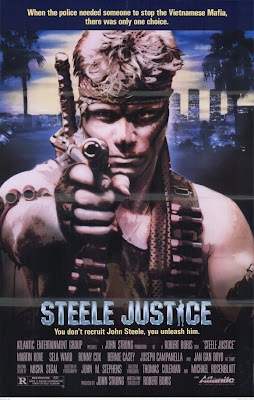 When the Black Tigers do something really, really bad (I'm a master at avoiding spoilers), Steele straps two bandoliers of bullets to his bare chest and gets the only kind of justice he can...STEELE JUSTICE! First off, John Steele (gotta love the name) has a gun that shoots knives. That's pretty memorable right there. But also he has a pet: Threestep the snake. He is named this because his poison is so deadly, you won't make it three steps before you die. Also, and this isn't said in the film, we can gather that Steele is a big fan of Lynyrd Skynyrd, especially the song "Gimme Three Steps". The bar he frequents also features the Desert Rose Band, featuring Chris Hillman of Byrds fame, so we know Steele likes country-rock. And speaking of his musical tastes, during a movie highlight, a car chase interrupts a video shoot for Astrid Plane (of Animotion fame), so we can also gather he hates 80's pop. Even though the video was choreographed (and perhaps stars) Jeff Kutash. And in true 80's fashion, there is a montage set to the song "fight fire with fire" by Hot Pursuit. Sela Ward, as the love interest, appears heavily medicated. However, she does get to say the line to Steele, "The war isn't over for you. It just changed locations." Asher Brauner makes a brief appearance as "Mob Thug #1", and most of the names in the cast, including Shannon Tweed, Irene Tsu and Eric Lee make very short, almost walk-on roles. Everybody knows/says the name "Steele" throughout the movie, and in true action movie fashion, it all ends in the typical abandoned warehouse. For generic 80's action that's so formulaic it can't miss, check out Steele Justice. My name is Robert Kim, I'm an actor and portrayed the role of Lt. Lee Van Minh (Martin Kove's Vietnam buddy) in the 1980's action flick, "Steele Justice." breaking her nose in the process. So yes, she WAS medicated for most of her scenes, but she just put on her game face and did a credible job when most people would have not even showed up. Just an interesting piece of movie trivia. You had me at 'gun that shoots knives'. Love that bit! 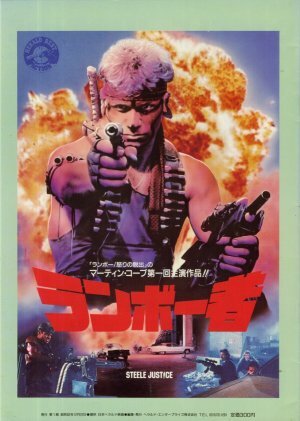 The movie is classic 80s fun. Would be interested in your opinion! I've had this on my to watch list for a while now, and I think based on your review it will stay there, and hopefully I'll get to it soon. It looks like fun, and I always love some good Martin Kove. Looking forward to your take on it DTVC! Kove Rules. "The war never ended for you John." "He isn't being recruited ... he's being unleashed." "They trained him to kill ... then they turned him loose." "You cannot stop him ... all you can do is kill him." "It'll take an Army to stop him." All I can do is shake my head in disbelief. I firmly believe 'Fight Fire with Fire" is the greatest track off any 80's film too. Can't agree more with your excellent comment. "You Don't Recruit John Steele. You Unleash Him." is one of the best taglines ever. Totally agree about the killer song too. The film actually played for a little more than a week at a theatre I once worked but never saw it. Ward here I think looks like she is doing a dress rehearsal for a screen test to play a Bond babe. That's cool it was at your theater! Do you have any other memories of movies like this playing there? We definitely recommend this. It's a lot of fun.